Did you miss me? I know I have been MIA (missing in action) lately. Just can’t believe how hectic this new school year has been so far. My 5th Grader’s homework and projects aren’t helping either. Oh well! The joys of motherhood. With such a busy schedule, I realized that I started to use my slow cooker (crock pot) more frequently. About 2-3 times a week to be exact. There’s just no way, I could do all the cooking for my food allergy family without my new BFF. Do you enjoy using your slow cooker too? Need some recipe ideas? Well, you’re in luck. 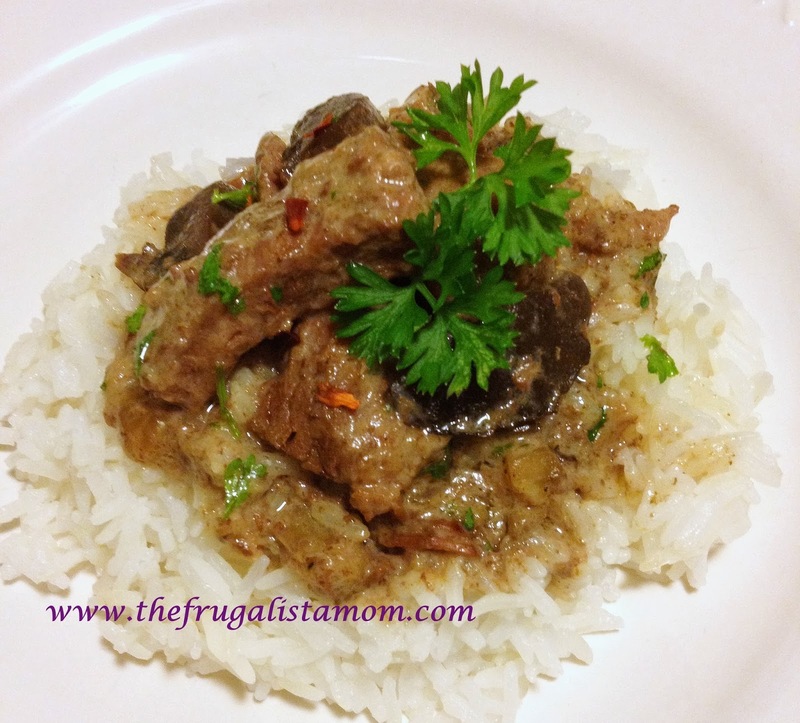 I am sharing with you today my secret Dairy Free recipe for Beef Stroganoff. Hearty, creamy and piping hot, this is real comfort food perfect for this cooler autumn weather. Best part is we don’t have to slaves in the kitchen to make it. Whether you have company to impress or just short in time, give this recipe a shot. I’m sure you’ll love it too. Your guests will never know how easy it is. So, can you keep this a secret? 1. Combine the broth, salt, pepper, chili flakes, thyme, garlic, nutmeg, mustard powder and bay leaf in the crock pot. 2. Add the beef stripes, onions and mushrooms. Mix well. 4. In a small bowl, combine the cornstarch and water. Make sure there are no lumps. 6. Pour the coconut milk and cornstarch mixture to the beef. Mix well. 7. Cook for another 1 hour on high or until the beef is tender. 8. Sprinkle with parsley before serving. Great on top of pasta or rice. If you will be out the whole day, you can combine all the ingredients except the parsley in the slow cooker. Cook for 8 hours on low. This is an awesome recipe! Not only did my milk-allergic daughter love it, my husband did too and had two heaping plates of it! Hello Kerby and Cristina! I'm so happy your family liked the recipe too. I'm glad you'll have a go-to dish that will not exclude your daughter with milk allergy. Have you try my other recipes? If so, please let me know how they turn out. Enjoy your weekend. How about adding a tablespoon or so of ketchup? Would that add enough tanginess to it? What about adding a tablespoon or so of ketchup? Would that help with the tanginess? This looks great! Definitely going to try it as we are also gluten, dairy, egg and soy free. For the tang, have you tried a little bit of apple cider vinegar. It wouldn't be exactly the same, but close maybe. I think I'll try your recipe as is, then maybe experiment a little, but if you have already given it a try I'd like to know how it turned out. Also thinking about adding a little bit of flax mayo. hi Jessica, I haven't tried it with apple cider vinegar because I'm afraid it might curdle. Were you able to try the recipe already? I love to hear your thoughts. I have to admit that I was skeptical here. It was AMAZING. The first night, there was still a hint of coconut, but after that, it mellowed out until I couldn't taste anything. The tang of sour cream isn't there, but I wouldn't say I missed it. I made this with 2 lbs of beef, and then I stirred in a bad of NoYolks for the last hour of cooking. Delish! The taste of sour cream is quite hard to mimic but I'm working on it. Hopefully I could accidentally get it one of these days. If you are using the stove top method, it will take about 2-3 hours on simmer. The thinner you slice the meat, the faster it will be. Looks good! Wonder how long it would take in a covered dutch oven on stove top?